Spinal cord injury is a traumatic medical condition that may result in elevated risks of chronic secondary metabolic disorders. Here, we presented a protocol using surface neuromuscular electrical stimulation-resistance training in conjunction with functional electrical stimulation-lower extremities cycling as a strategy to ameliorate several of these medical problems. Gorgey, A. S., Khalil, R. E., Lester, R. M., Dudley, G. A., Gater, D. R. Paradigms of Lower Extremity Electrical Stimulation Training After Spinal Cord Injury. J. Vis. Exp. (132), e57000, doi:10.3791/57000 (2018). Skeletal muscle atrophy, increased adiposity and reduced physical activity are key changes observed after spinal cord injury (SCI) and are associated with numerous cardiometabolic health consequences. These changes are likely to increase the risk of developing chronic secondary conditions and impact the quality of life in persons with SCI. Surface neuromuscular electrical stimulation evoked resistance training (NMES-RT) was developed as a strategy to attenuate the process of skeletal muscle atrophy, decrease ectopic adiposity, improve insulin sensitivity and enhance mitochondrial capacity. 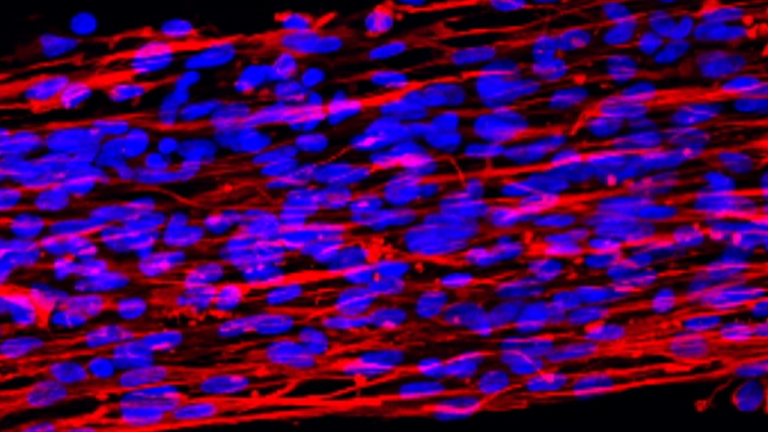 However, NMES-RT is limited to only a single muscle group. Involving multiple muscle groups of the lower extremities may maximize the health benefits of training. Functional electrical stimulation-lower extremity cycling (FES-LEC) allows for the activation of 6 muscle groups, which is likely to evoke greater metabolic and cardiovascular adaptation. Appropriate knowledge of the stimulation parameters is key to maximizing the outcomes of electrical stimulation training in persons with SCI. Adopting strategies for long-term use of NMES-RT and FES-LEC during rehabilitation may maintain the integrity of the musculoskeletal system, a pre-requisite for clinical trials aiming to restore walking after injury. The current manuscript presents a combined protocol using NMES-RT prior to FES-LEC. We hypothesize that muscles conditioned for 12 weeks prior to cycling will be capable of generating greater power, cycle against higher resistance and result in greater adaptation in persons with SCI. It is estimated that approximately 282,000 persons in the U.S. are currently living with spinal cord injury (SCI)1. On average, there are roughly 17,000 new cases annually, primarily caused by motor vehicle crashes, acts of violence, and sporting activities1. SCI results in partial or total interruption of neural transmission across and below the level of injury2, leading to sub-lesional sensory and/or motor loss. After injury, activity of skeletal muscle below the level of injury is greatly reduced, leading to a rapid decline in lean mass and concomitant infiltration of ectopic adipose tissue, or intramuscular fat (IMF). Studies have shown that lower extremity skeletal muscle experiences significant atrophy within the first few weeks of injury, continuing throughout the end of the first year3,4. As soon as 6 weeks post-injury, individuals with complete SCI experienced an 18-46% decrease in sub-lesional muscle size compared to age and weight-matched abled-bodied controls. By 24 weeks post-injury, skeletal muscle cross-sectional area (CSA) could be as low as 30 to 50%3. Gorgey and Dudley showed that skeletal muscle continues to atrophy by 43% of the original size 4.5 months post-injury and noted a three times greater amount of IMF in persons with incomplete SCI compared to abled-bodied controls4. Loss of metabolically active lean mass results in a reduction in basal metabolic rate (BMR)2,6, which accounts for ∼65-70% of the total daily energy expenditure; such reductions in BMR can lead to a detrimental energy imbalance and increasing adiposity after injury2,7,8,9,10,18. Heightened adiposity has been linked to the development of chronic secondary conditions including hypertension, type II diabetes mellitus (T2DM) and cardiovascular disease2,10,11,12,13,14,15,16,17,18. Moreover, persons with SCI may suffer from malnutrition and reliance on a high fat diet. Dietary fat intake may account for 29 to 34% of the fat mass in persons with SCI, which is likely a factor explaining increasing adiposity and the escalating prevalence of obesity within the SCI population12,13. Neuromuscular electrical stimulation evoked resistance training (NMES-RT) was designed to induce hypertrophy of paralyzed skeletal muscle19,20,21,22,23,24. 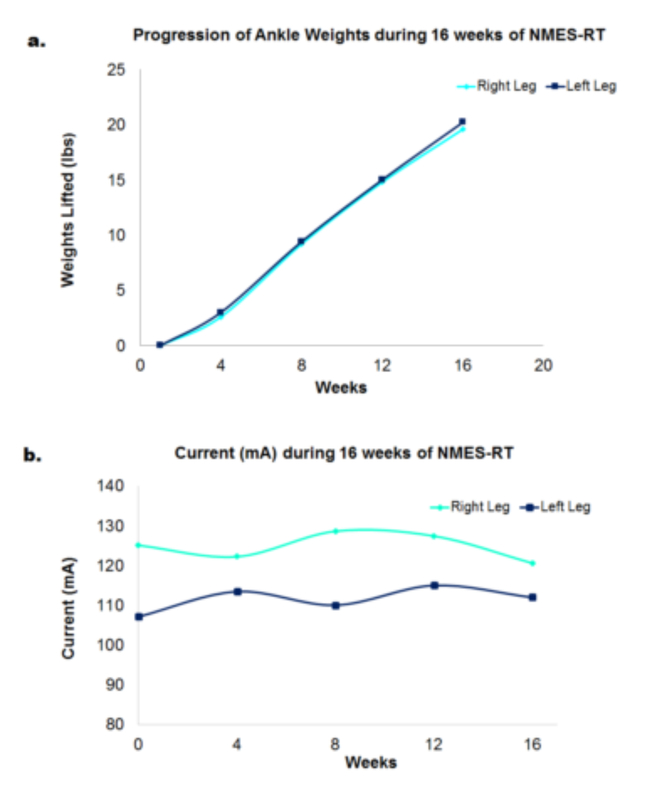 Following twelve weeks of twice-weekly NMES-RT, skeletal muscle CSA of the whole thigh, knee extensor and knee flexor muscle groups increased by 28%, 35% and 16%, respectively22. Dudley et al. showed that 8 weeks twice-weekly of NMES-RT restored knee extensor muscle size to 75% of the original size at six weeks post-injury19. Moreover, Mahoney et al. utilized the same protocol and noted a 35% and 39% increase in the right and left rectus femoris muscles after 12 weeks of NMES-RT20. Functional electrical stimulation-lower extremities cycling (FES-LEC) is a common rehabilitation technique used to exercise lower extremity muscle groups after SCI25,26. Unlike NMES-RT, FES-LEC relies on stimulation of 6 muscle groups, which may result in increased hypertrophy and improvements in the cardiometabolic profile10,25,26,27,28. Dolbow et al. found that total body lean mass increased by 18.5% following 56 months of FES-LEC in an individual with SCI27. Following twelve months of thrice-weekly FES-LEC, a 60-year old female with paraplegia experienced a 7.7% increase in total body lean mass and a 4.1% increase in leg lean mass28. Routine use of functional electrical stimulation (FES) is associated with improvement in risk factors of cardiometabolic conditions after SCI10,25,26. Ideal candidates for electrical stimulation training will have either motor complete or incomplete injuries, with intact peripheral motor neurons and limited lower extremity sensation. The current manuscript, describes a combined approach using NMES-RT and FES-LEC designed to improve outcomes of electrical stimulation training in persons with chronic SCI. 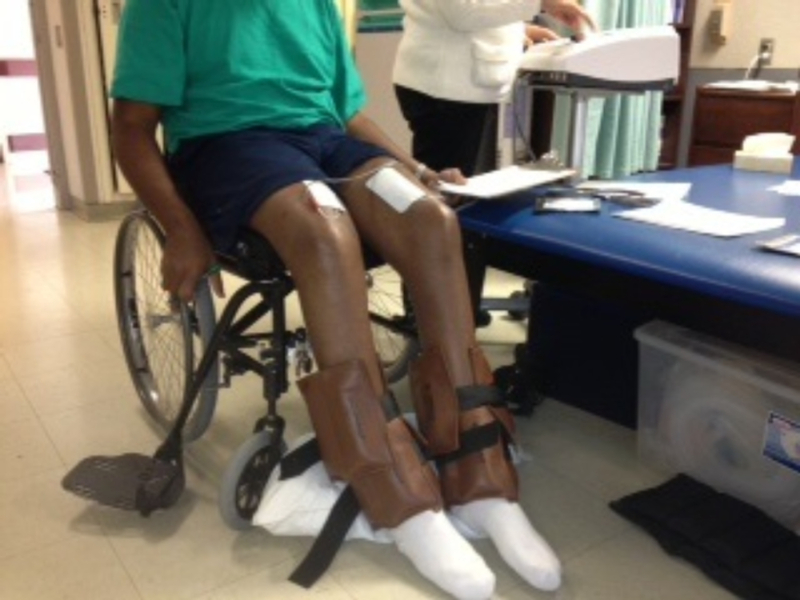 The process of NMES-RT using ankle weights will be outlined, while highlighting key steps within the protocol and the overall benefit the intervention provides to persons with chronic SCI. The second aim is to describe the process of FES-LEC designed to maximize the overall cardiometabolic effect of intervention. Previous work has affirmed our rational that a combined training protocol may evoke greater outcomes following 24 weeks of electrical stimulation training20,21,22,23,24,25,26,31,32,33,34,35,36. The training protocol described in this manuscript is registered with clinicaltrials.gov identifier (NCT01652040). The training program involves NMES-RT with ankle weights and FES-LEC. All necessary equipment is listed in Table 2. The study protocol and informed consent were reviewed and approved by the Richmond VAMC Institutional Review Board (IRB) and Virginia Commonwealth University (VCU) IRB. All study procedures were explained in-detail to each participant before beginning the trial. Perform a pre-screening evaluation with potential participants. Thoroughly explain the details of the training protocol including the length of study (24 weeks), times per week (bi-weekly) and length of sessions (NMES-RT: 30 min and FES-LEC: 45-60 min). NOTE: NMES-RT is conducted for the first 12 weeks, followed by 12 weeks of FES-LEC. Describe the medical requirements to the potential participant including: male or female with SCI, American Spinal Injury Classification (AIS) A, B or C (those with an AIS "C" classification who are unable to stand up and walk), 18 to 65-year old, greater than 1-year post-injury, body mass index (BMI) ≤ 30 kg/m2, motor complete or incomplete C5-L2 level of injury. Describe the medical restrictions to the potential participant including: a diagnosis of cardiovascular disease, uncontrolled type II diabetes mellitus or those on insulin, uncontrolled hypertension, pressure sores stage 3 or greater, urinary tract infection or symptoms, osteoporosis with T-Score -2.5, and pregnancy for women with SCI. Ensure the participant voids his/her bladder and measure the resting blood pressure and heart rate. While participant is seated in wheelchair, instruct the participant to take off his/her shoes. Then, place a pillow behind the calf to cushion the leg during knee flexion. Apply ankle weights (0-26 lbs.) to the participant's ankles (Figure 1). NOTE: The initial 2 sessions are conducted without ankle weights to ensure the participant can lift his/her leg against gravity. Apply two 7.5 cm x 12.7 cm adhesive carbon electrodes bilaterally on the skin over the knee extensor muscle group. Place the distal electrode ~1/3 the distance between the patella and inguinal fold and medial to the midline of the quadriceps. Place the electrode longitudinally and parallel to the midline axis running from the hip to the knee joints (Figure 2). Place the proximal electrode laterally and adjacent to the inguinal fold over the vastus lateralis muscle. Place the electrode longitudinally and parallel to the midline axis (Figure 2). Set a portable stimulator to a frequency of 30 Hz and a biphasic rectangular pulse width of 450 µs and 50 µs interpulse interval19,20,21,22,23,24,37,38,39. Connect the cables from the stimulator to each electrode. NOTE: The polarity of the electrodes does not influence the stimulation pattern as long as the electrodes are positioned correctly. Beginning with the right leg, gradually increase the current until a noticeable visible tension is recognized in the knee extensor muscle group. Continue to slowly ramp the current to evoke full knee extension (max. 200 mA). Allow the leg to remain extended for 3-5 s to evoke maximum tension in the activated motor units. Gradually decrease the current until it's below 50% of the target current required to extend the leg and move leg eccentrically back to the starting position. Record the current amplitude necessary to evoke full leg extension. Complete unilateral training including 4 sets of 10 repetitions per leg and alternate between right and left legs. Allow the leg to rest 3-5 s between each repetition and 3 min between sets. If participant does not reach full knee extension, record the %range of motion and increase the time between repetitions. NOTE: Muscle fatigue is defined as two consecutive repetitions with a range of motion ≤ 25%. Attempt each of the four sets, but if participant experiences muscle fatigue, end the current set and continue training on the opposite leg. If full knee extension is achieved without muscle fatigue for 2 consecutive training sessions, add 2 lbs. of ankle weights the following week of training. Measure the participant's resting blood pressure and heart rate. Position the participant in front of the FES ergometer bike (Table of Materials) seated in his/her personal power or manual wheelchair (Figure 3a, Figure 3b). Apply adhesive carbon electrodes to the knee extensor, knee flexor and gluteus maximus muscle groups bilaterally. For knee extensors, place the distal electrode (7.5 x 12.7 cm) on the skin 1/3 the distance between the patella and inguinal fold, over the vastus medialis muscle. Place the proximal electrode laterally and adjacent to the inguinal fold over the vastus lateralis muscle (Figure 4a). For knee flexors, place the distal electrode (7.5 x 10 cm) on the skin 2-3 cm above the popliteal fossa. Place the proximal electrode 20 cm above the popliteal fossa (Figure 4b). To prevent movement of the distal electrode, apply an elastic wrap to secure positioning of the electrode (Figure 3a). For gluteus maximus, instruct the participant to lean forward towards the ergometer. Place two electrodes (5 x 9 cm) parallel and on the bulk of the muscle belly; allow ~two fingers width of separation between the electrodes. With the participant seated in his/her wheelchair and centered in front of the ergometer, connect the cables from the stimulator to each of the 12 electrodes. Check the front and back of the ergometer to make sure the participant is correctly centered. Ensure that the participant's wheelchair is locked and gently place the participant's feet (wearing tennis shoes) inside the pedals (Figure 6). Secure the lower leg to the ergometer using the elastic straps wrapped in a fabric covering. Secure the participant's feet in place with the two crossing elastic straps and Velcro located on each petal (Figure 5). After strapping the legs to the ergometer, passively move the legs so observe the cycling pattern. If the legs are too compressed or hyperextended, adjust the height of the bike and recheck the position by passively moving the leg. Secure the participant's wheelchair to the ergometer using the two extendable hooks located at the base of the ergometer. Connect the hooks to a stable structure underneath the wheelchair (Figure 5). Place two wooden breaks underneath the wheels of the wheelchair, to prevent any movement of chair during cycling. Set the stimulation frequency to 33.3 Hz, pulse duration to 350 µs and the current amplitude to 140, 100, 100 mA for the knee extensor, knee flexor and gluteus maximus muscle groups, respectively. Set the cycle parameters as follows: target speed of 40-45 revolutions per minute (RPM); adjustable motor torque starting at 10 Nm; resistance of 1.0, 1.5 and 2.0 Nm for exercise stages I, II and III. Set the interval training parameters as follows: 3 min "warm up" phase; three 10-min exercise stages (stimulation on); a 2-min resting phase following each exercise stage; and 3 min "cool down" phase. Based on the level of injury (above or below T4), measure the blood pressure and heart rate every 2 to 5 min to prevent the occurrence of any symptoms of autonomic dysreflexia. If blood pressure remains elevated, stop the ergometer and instruct the participant to void his/her bladder or rest if they have already voided. In addition, check to ensure the participant is seated properly to reduce any pressure points and check that the shoes or any straps are not overly-tightened. Monitor blood pressure closely every 2 min. If blood pressure recovers, resume training; if blood pressure remains unrecovered, end the session and instruct the participant to see his/her primary care physician. NOTE: It is vital to ensure that participants consistently take their blood pressure medication, if any, and void their bladder before FES-cycling. Record the participant's heart rate, speed, power, distance, resistance and % stimulation every 30 s.
If participant completes an entire exercise session without fatigue (speed < 18 RPM during active cycling), decrease the servo motor torque assistance by 1 Nm the following session, otherwise keep all parameters the same. If participant completes two exercise training sessions without fatigue or the use of servo motor assistance during exercise stages, increase the resistance by 0.5 Nm in each exercise stage. Ankle weights increased progressively for 22 participants, over 16 weeks of NMES-RT (Figure 6a). The average weights lifted by the participants was 19.6 ± 6.5 lb. (right leg) and 20 ± 6 lbs. (left leg) [8-24 lb.]. Current amplitude fluctuated throughout the trial for right and left legs (Figure 6b). Progression of an individual with motor complete SCI following 12 weeks of FES-LEC training is highlighted in Table 1. The results indicate that with FES-LEC, there is an increase in the percentage of current stimulation to offset for the increased flywheel resistance over 12 weeks of training. Flywheel resistance increased by 3-4 times in each of the 3 stages throughout the 12-week training (Table 1). The resistance progressed from 1.6 to 5.1 Nm (stage I), 2.12 to 5.5 Nm (stage II) and 2.12 to 5.5 Nm (stage III). It is worth noting that each 10-min stage was interspersed by a 2-min resting period in which participants passively cycled against 0.77 Nm. Finally, power output increased by 2-4 times in each of the 3 stages between week 1 and week 12 (Table 1). Power progressed from 4 to 14 W (stage I), 5.4 to 11.24 W (stage II) and 2.6 to 11 W (stage III). Figure 1. NMES-RT setup showing the surface electrodes, stimulator, bilateral ankle weights and pillow cushion. Four sets of ten repetitions are completed for both right and left legs. Weights are progressively increased by 2 lbs. each week if each set is completed without muscle fatigue. Please click here to view a larger version of this figure. Figure 2. 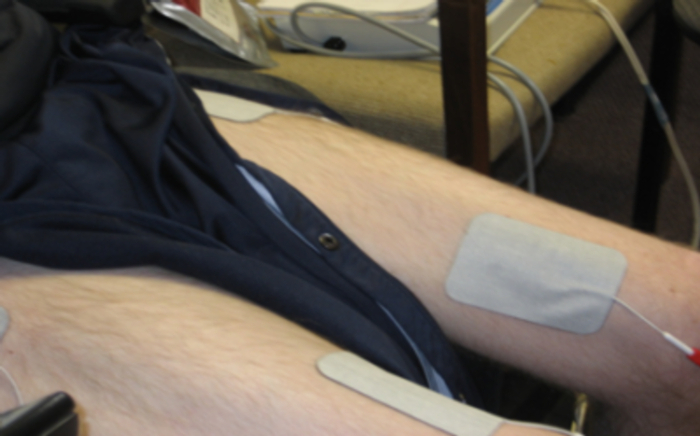 Knee extensor surface electrodes used during NMES-RT. One electrode is placed ~1/3 the distance between the patella and inguinal fold and medial to the midline of the quadriceps. A second electrode is placed laterally and adjacent to the inguinal fold over the vastus lateralis muscle. Please click here to view a larger version of this figure. Figure 3. Anterior (a) and lateral (b) views of bike setup during FES-LEC. The participant is seated in his wheelchair and secured to the bike to perform FES cycling. Elastic wraps are wrapped around each leg to secure the distal knee flexor electrodes. Please click here to view a larger version of this figure. Figure 4. The knee extensor surface electrodes (a) used during FES-LEC and the knee flexor surface electrodes (b). (a) One electrode is placed ~1/3 the distance between the patella and inguinal fold and medial to the midline of the quadriceps. A second electrode is placed laterally and adjacent to the inguinal fold over the vastus lateralis muscle. (b) While supporting the leg, one electrode is placed on the skin 2-3 cm above the popliteal fossa; the second electrode is placed 20 cm above the popliteal fossa. Please click here to view a larger version of this figure. Figure 5. The participant's foot is secured to the pedal by crossing two elastic straps located on each petal. It is essential that these straps are secured tightly to prevent the foot from moving when cycling against increased resistance. The patient's wheelchair is secured to the bike using the two extendable hooks located at the base of the bike. Once attached to the wheelchair, these hooks are cranked and tightened to remove any slack. Please click here to view a larger version of this figure. Figure 6. The progression of ankle weights (lbs.) of 22 participants throughout 16 weeks of NMES-RT and the progression of current amplitude (mA) throughout 16 weeks of NMES-RT. (a) Weight was increased by 2 lbs. weekly if the participant could complete 4 sets of 10 repetitions without muscle fatigue. (b) During training, current amplitude was gradually increased to bring the leg into full knee extension. Please click here to view a larger version of this figure. Table 1: Percentage Stimulation of the current amplitude, Flywheel Resistance and Power Output increased throughout the 12 weeks of FES-LEC in an individual with SCI. Resistance was increased each week if 2 sessions were completed without evidence of muscle fatigue (speed < 18 rpm). Percentage stimulation increased gradually throughout the 12 weeks of training. Power output increased during each incremental exercise stage and over the course of training. NOTE: Data is from one participant who completed 12 weeks of FES-LEC after finishing 12 weeks of NMES-RT. The current study demonstrated two different paradigms of electrical stimulation. One paradigm is focused on implementing progressive loading to the trained muscle to evoke skeletal muscle hypertrophy and the other paradigm is primarily intended to enhance cardio-metabolic performance via enhancing aerobic capacity. The study ensured to compare both paradigms and to highlight the pros and cons of each. NMES-RT is proven to be effective in restoring muscle size and evoking hypertrophy in persons with acute and chronic SCI19,20,21,22,23,24. The current intervention relies on dual channel stimulation units which is likely to be accessible in most clinical settings or for home use for persons with SCI. There is an unsubstantiated myth that progressive loading of the paralyzed knee extensor may result in fracture of the femoral or tibial condyles. However, based on the current evidence, we and others did not experience a single incidence of fracture. This may highlight that the current protocol is safe and accessible to be used after SCI. When using NMES-RT, a biphasic wave is preferred because it is proven to be safe and capable of generating a powerful muscle contraction that can extend the leg against gravity while lifting ankle weights. For those individuals with intact sensation, the biphasic wave appears to be more comfortable and tolerable. The frequency (30 Hz), biphasic duration (400 µs) with inter-pulse interval (50 µs) are selected based on our previously published research showing that a lower frequency reduces muscle fatigue and helps produce tetanic contraction of the knee extensors37,38. A pulse duration of 450 µs has shown to increase activation of the stimulated muscles and generate greater evoked torque, thus ensuring maximum recruitment of paralyzed muscles during training37. Moreover, it is necessary to gradually ramp the current to avoid the use of excessive current amplitude that may cause rapid muscle fatigue in the knee extensors. The training strategy including the amount of rest, frequency and pulse width are designed to prevent the occurrence of adverse events similar to autonomic dysreflexia especially in individuals with a level of injury above T4. NMES-RT prior to cycling may evoke greater muscle hypertrophy and reduce muscle fatigue. Increased fatigue resistance and strength may optimize FES-LEC cycling and maximize training outcomes. Gorgey et al. demonstrated that 12 weeks, twice-weekly, of NMES-RT elicited a more than 35% increase in muscle size and decreased IMF and visceral adipose tissue22. In addition, NMES-RT has shown to increase glucose transporter type-4 (GLUT-4) concentration, which is associated with increased fatigue resistance36,46. Sabatier et al. reported that fatigue resistance of the trained knee extensors increased by 33% following 18 weeks of NMES-RT and concluded that NMES-RT sufficient to evoke muscle hypertrophy, also reduced muscle fatigue46. NMES-RT has shown to evoke positive adaptation in the mitochondria of muscle cells. Ryan et al. noted a 25% improvement in mitochondrial capacity following 16 weeks of NMES-RT, twice weekly, in persons with chronic complete SCI23. A combined training program, as described in the current manuscript, designed to increase muscle mass and reduce muscle fatigue may improve cardiometabolic health and contribute to FES-LEC being more effective. There is limited evidence of cardiometabolic adaptation following prolonged FES-LEC in persons with SCI. FES-LEC training has varied from 2 to 7 times weekly for 1.5 to 12 months; exercise duration has varied from 20 to 60 min26. Past studies using FES-LEC showed a modest improvement in insulin sensitivity and aerobic fitness31,32. Mohr et al. showed that 3 days a week of FES-LEC performed for 1 h resulted in a 25% improvement in insulin sensitivity in persons with SCI31. Similarly, eight weeks of daily FES-LEC resulted in a 33% improvement in insulin sensitivity for 5 men with cervical SCI32. Moreover, FES-LEC showed a limited response on oxygen uptake and cardiovascular demand compared to arm crank ergometry (ACE) or hybrid exercise42. Most FES-LEC trials use some form of motor support where the motor of the bike applies forces to the pedals to assist in completing the cycle. Motorization allows a larger proportion of person with SCI to undertake FES cycling, especially those unable to generate and maintain sufficient muscle force to rotate the flywheel or those with low-tolerance to FES due to residual sensation43. However, for those capable of producing sufficient muscle force, assistance from FES motor-support may limit the outcomes of training. For this reason, the current method only uses motor-support if the participant experiences muscles fatigue and during the resting phases. This allows the knee extensor, knee flexor and gluteal muscle groups to provide maximum effort when cycling which may maximize cardiometabolic adaptation as demonstrated by increasing resistance and power output over 12 weeks of FES-LEC. In addition, FES-LEC is limited by rapid muscle fatigue during cycling44, especially when using minimal motor-support. Previously published work has shown a wide variability in the cycling endurance of persons with SCI. Ten individuals with motor-complete SCI cycled using FES ergometry until their muscles fatigued. One participant exercised for a total of 3 min while another exercised for 10 minutes44. In the current training study, we have sought to provide an equal dose of treatment among participants in the form of 30 min of FES-training. This will ensure treatment consistency among each participant to ensure that adaptation, or lack thereof, is strictly due to the output of the activated muscles and not limited by the duration of cycling. Representative results showed that in an individual with SCI in which 12 weeks of FES-LEC was preceded with 12 weeks of NMES-RT, both resistance and power output increased over the course of intervention. Unlike previous studies that decreased cadence to increase resistance 43,47, the current study has adopted a strategy to increase the resistance with a target speed of 40-45 RPM. This may be a successful strategy, especially after 12 weeks of conditioning the muscles using NMES-RT to improve muscle quality22. Applications of electrical stimulation, including FES-LEC, should benefit greatly from improving muscle quality48 and may result in greater force and power output of the trained muscles. Greater power output may lead to cardiovascular and bone adaptation to attain outcomes similar to what has been attained using ACE or hybrid exercise. The power generated by muscles during FES-LEC exercise may stimulate adaptations to bone by exposing lower extremity limbs to repeated loading cycles at high resistance. For instance, Johnston et al. showed a low cycling cadence at 2.9 Nm may improve parameters of bone health following 6 months of FES-LEC in persons with SCI compared to high cadence that generates a torque of 0.8 Nm47. The current study demonstrated that the resistance can be increased up to 5.5 Nm. This is double the torque output reported at the low-cadence and it is likely to have greater impact on parameters of bone and cardiovascular health. 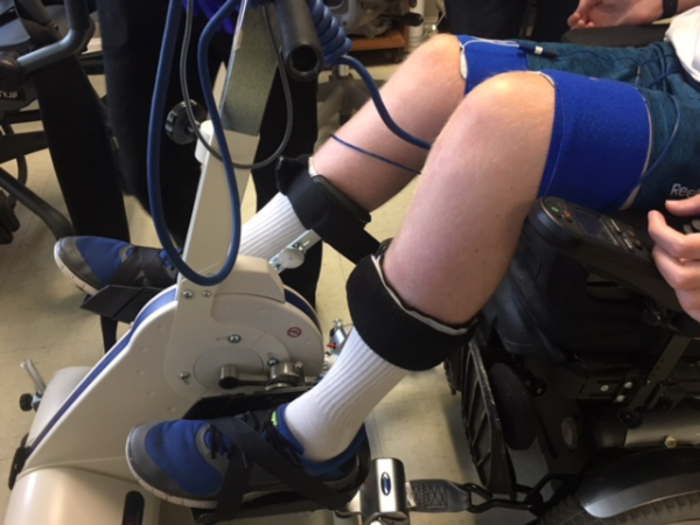 The ergometer used in the current protocol (Table of Materials) is operated directly from the participants' wheelchair, eliminating the need for transfer and allowing for stimulation of up to 12 muscle groups of the thigh, lower leg and trunk. We have chosen to stimulate the quadriceps, hamstring, and gluteus maximus muscles of the lower extremity. Future trials will expand to stimulate the abdominal and back muscles in persons with SCI. Additionally, the ergometer weighs only 39 kg, making it far more compact and adaptable than other commercially available FES ergometers. The ergometer also has an adjustable motor-assist function which allows the participant to maximize his/her training without motor support when appropriate. Moreover, the ergometer allows for optional motor-assistance. The current protocol permits motor-support during 1) the warm-up phase, 2) the first "active transition" phase (first 1-2 min of exercise phase), 3) each resting phase and 4) if participant fatigues against resistance. During active cycling, the motor is off to adequately challenge each participant. Muscle fatigue during cycling was defined as the point where speed drops below 18 RPM. Additionally, Gorgey et al. revealed the training effect of three different stimulation parameters, varying in pulse duration (200, 350 and 500 µs), on the cycling performance in 10 individuals with chronic SCI. After a single bout of FES-LEC, knee extensor torque dropped by 33-59% and remained significantly unrecovered following 48-72 h44. Based on these findings, we believe that twice-weekly is a reasonable exercise dose for individuals with chronic SCI and allows enough time (48 h) for recovery of the fatigued muscles. During FES-LEC, the stimulation parameters are set to prevent any episodes of autonomic dysreflexia, while still promoting robust cardiometabolic adaptation; the cycling parameters were designed with this balance in mind and are as follows: frequency (33.3 Hz), resistance (adjustable), target speed (40-45 RPM) and pulse duration (350 µs). Frequency is set at 33.3 Hz to minimize muscle fatigue; current amplitude (%stimulation) is gradually increased by the ergometer to maintain a speed above 18 RPM. Recent findings suggest that a pulse duration greater than 350 µs during FES ergometry triggers autonomic dysreflexia in persons with SCI44. Additionally, a pulse duration of 350 µs increased delta energy expenditure when compared to a pulse duration of 200 µs. Furthermore, delta energy expenditure was not any greater when set to 500 µs44. The higher incidence of autonomic dysreflexia during FES-LEC may be attributed to the fact that 6 muscle groups are stimulated simultaneously. This is likely to increase the current density and the number of nociceptors being activated, resulting in flooding of noxious stimuli to the nervous system. This is unlikely to happen during NMES-RT because of training of a single muscle group; however, this may occur in persons with high level of injury similar to C6 SCI. Anecdotal clinical experience showed that this is likely to fade out with training as persons with SCI becomes less vulnerable to develop autonomic dysreflexia. The aforementioned parameters have been validated to ensure participant's safety, while maximizing the training outcomes. There are few limitations that need to be addressed when considering similar combined training protocols. Inevitably, training outcomes and body composition may be confounded by certain variables; the greatest being dietary intake. To eliminate this variability as much as possible, clinicians should evaluate caloric intake reports on a weekly basis. The collection of weekly reports, may allow clinicians to closely monitor extra-caloric intake (> 300-500 kcal/week of his/her baseline BMR) and instruct SCI persons to adjust his/her macronutrient ratios as needed. In addition to dietary variability, the current training program may not be applicable to the 20-25% of the SCI population who cannot exercise using electrical stimulation due to denervation of skeletal muscle. Additionally, previous data shows that persons with SCI are likely to lose training benefits after cessation of the training program49; therefore, clinical interventions should provide mechanisms to guarantee long-term compliance, similar to reducing the training frequency to twice-weekly and/or providing home-based telehealth alternatives24. Future studies investigating the effects of NMES-RT and FES-LEC should utilize telehealth strategies to overcome socioeconomic barriers to exercise and encourage long-term compliance. NMES-RT conducted using telehealth video-conferencing was capable of increasing thigh absolute muscle by 11% and decreasing whole thigh IMF by 14% in five men with motor complete SCI24. Training was conducted twice-weekly for 8 weeks using a portable battery-operated stimulator. Participants were monitored via webcam to ensure safety and proper setup throughout the training program24. The use of NMES-RT in combination with FES-LEC may be an effective strategy to maximize the outcomes of bi-weekly electrical stimulation training. Using NMES to stimulate thigh muscles has proven to evoke muscle hypertrophy, increase strength and reduce fatigue. Stronger, leaner leg muscles may be able to evoke greater power when cycling, more efficiently utilize oxygen and maximize the cardiometabolic benefits of training in persons with SCI. We would like to thank the participants who devoted the time and effort to participate in the previous studies. We would like to thank Hunter Holmes McGuire Research Institute and Spinal Cord Injury Services and Disorders for providing the environment to conduct clinical human research trials. Ashraf S. Gorgey is currently supported by the Department of Veteran Affairs, Veteran Health Administration, Rehabilitation Research and Development Service (B7867-W) and DoD-CDRMP (W81XWH-14-SCIRP-CTA). elastic NuStim wraps (2) Fabrifoam (Exton, PA, USA 19341) PP108666 36"
ankle weights n/a n/a 2-26 lb. National Cord Injury Statistical Center. Facts and Figures at a Glance. University of Alabama at Birmingham. Birmingham, AL. (2016). Gorgey, A., Dolbow, D., Dolbow, J., Khalil, R., Castillo, C., Gater, D. Effects of spinal cord injury on body composition and metabolic profile-Part I. J Spinal Cord Med. 37, (6), 693-702 (2014). Castro, M., Apple, D., Hillegass, E., Dudley, G. Influence of complete spinal cord injury on skeletal muscle cross-sectional area within the first 6 months of injury. Eur J Appl Physiol O. 80, (4), 373-378 (1999). Gorgey, A., Dudley, G. Skeletal muscle atrophy and increased intramuscular fat after incomplete spinal cord injury. Spinal Cord. 45, (4), 304-309 (2007). Elder, C., Apple, D., Bickel, C., Meyer, R., Dudley, G. Intramuscular fat and glucose tolerance after spinal cord injury - a cross-sectional study. Spinal Cord. 42, (12), 711-716 (2004). Monroe, M., Tataranni, P., Pratley, R., Manore, M., Skinner, J., Ravussin, E. Lower daily energy expenditure as measured by respiratory chamber in subjects with spinal cord injury compared with control subjects. Am J Clin Nutr. 68, (6), 1223-1227 (1998). Buchholz, A., Pencharz, P. Energy expenditure in chronic spinal cord injury. Curr Opin Clin Nutr. 7, (6), 635-639 (2004). Buchholz, A., McGillivray, C., Pencharz, P. Physical activity levels are low in free-living adults with chronic paraplegia. Obes Res. 11, (4), 563-570 (2003). Olle, M., Pivarnik, J., Klish, W., Morrow, J. Body composition of sedentary and physically active spinal cord injured individuals estimated from total body electoral conductivity. Arch Phys Med Rehab. 74, (7), 706-710 (1993). Mollinger, L., et al. Daily energy expenditure and basal metabolic rates of patients with spinal cord injury. Arch Phys Med Regab. 66, (7), 420-426 (1985). Gater, D. Obesity after spinal cord injury. Phys Med Rehabil Cli. 18, (2), 333-351 (2007). Khalil, R., Gorgey, A., Janisko, M., Dolbow, D., Moore, J., Gater, D. The role of nutrition in health status after spinal cord injury. Aging Dis. 4, (1), 14-22 (2013). Gorgey, A., et al. Frequency of Dietary Recalls, Nutritional Assessment, and Body Composition Assessment in Men with Chronic Spinal Cord Injury. Arch Phys Med Rehab. 96, (9), 1646-1653 (2015). Bauman, W., Spungen, A. Carbohydrate and lipid metabolism in chronic spinal cord injury. J Spinal Cord Med. 24, (4), 266-277 (2001). Bauman, W., Spungen, A. Disorders of carbohydrate and lipid metabolism in veterans with paraplegia or quadriplegia: a model of premature aging. Metabolism. 43, (6), 749-756 (1994). Bauman, W., Spungen, A., Zhong, Y., Rothstein, J., Petry, C., Gordon, S. Depressed serum high density lipoprotein cholesterol levels in veterans with spinal cord injury. Paraplegia. 30, (10), 697-703 (1992). Nash, M., Mendez, A. A guideline-driven assessment of need for cardiovascular disease risk intervention in persons with chronic paraplegia. Arch Phys Med Rehab. 88, (6), 751-757 (2007). Aksnes, A., Hjeltnes, N., Wahlstrom, E., Katz, A., Zierath, J., Wallberg-Henriksson, H. Intact glucose transport in morphologically altered denervated skeletal muscle from quadriplegic patients. Am J Physiol. 271, (3), E593-E600 (1996). Dudley, G., Castro, M., Rogers, S., Apple, D. A simple means of increasing muscle size after spinal cord injury: a pilot study. Eur J Appl Physiol O. 80, (4), 394-396 (1999). Mahoney, E., et al. Changes in skeletal muscle size and glucose tolerance with electrically stimulated resistance training in subjects with chronic spinal cord injury. Arch Phys Med Rehab. 86, (7), 1502-1504 (2005). Gorgey, A., Shepherd, C. Skeletal muscle hypertrophy and decreased intramuscular fat after unilateral resistance training in spinal cord injury: case report. J Spinal Cord Med. 33, (1), 90-95 (2010). Gorgey, A., Mather, K., Cupp, H., Gater, D. Effects of resistance training on adiposity and metabolism after spinal cord injury. Med Sci Sport Exer. 44, (1), 165-174 (2012). Ryan, T., Brizendine, J., Backus, D., McCully, K. Electrically induced resistance training in individuals with motor complete spinal cord injury. Arch Phys Med Rehab. 94, (11), 2166-2173 (2013). Gorgey, A., et al. Feasibility Pilot using Telehealth Video-Conference Monitoring of Home-Based NMES Resistance Training in Persons with Spinal Cord Injury. Spinal Cord Ser Cases. 3, (17039), (2017). Gater, D., Dolbow, D., Tsui, B., Gorgey, A. Functional electrical stimulation therapies after spinal cord injury. NeuroRehabilitation. 28, (3), 231-248 (2011). Gorgey, A., Dolbow, D., Dolbow, J., Khalil, R., Gater, D. The effects of electrical stimulation on body composition and metabolic profile after spinal cord injury - Part II. J Spinal Cord Med. 38, (1), 23-37 (2015). Dolbow, D., Gorgey, A., Khalil, R., Gater, D. Effects of a fifty-six month electrical stimulation cycling program after tetraplegia: case report. J Spinal Cord Med. 40, (4), 485-488 (2016). Dolbow, D., Gorgey, A., Gater, D., Moore, J. Body composition changes after 12 months of FES cycling: case report of a 60-year-old female with paraplegia. Spinal Cord. 1, (S3-S4), (2014). Gorgey, A., Cho, G., Dolbow, D., Gater, D. Differences in current amplitude evoking leg extension in individuals with spinal cord injury. NeuroRehabilitation. 33, (1), 161-170 (2013). Wade, R., Gorgey, A. Skeletal muscle conditioning may be an effective rehabilitation intervention preceding functional electrical stimulation cycling. Neural Regen Res. 11, (8), 1232-1233 (2016). Mohr, T., Dela, F., Handberg, A., Biering-Sørensen, F., Galbo, H., Kjaer, M. Insulin action and long-term electrically induced training in individuals with spinal cord injuries. Med Sci Sports Exer. 33, (8), 1247-1252 (2001). Jeon, J., et al. Improved glucose tolerance and insulin sensitivity after electrical stimulation-assisted cycling in people with spinal cord injury. Spinal Cord. 40, (3), 110-117 (2002). Kjaer, M., et al. Fatty acid kinetics and carbohydrate metabolism during electrical exercise in spinal cord-injured humans. Am J Physiol-Reg I. 281, (5), R1492-R1498 (2001). Hettinga, D., Andrews, B. 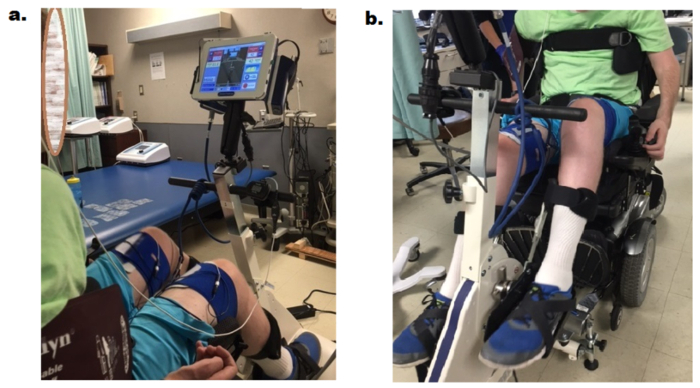 Oxygen consumption during functional electrical stimulation assisted exercise in persons with spinal cord injury: implications for fitness and health. Sports Med. 38, (10), 825-838 (2008). Yarar-Fisher, C., Bickel, C., Windham, S., McLain, A., Bamman, M. Skeletal muscle signaling associated with impaired glucose tolerance in spinal cord-injured men and the effects of contractile activity. J Appl Physiol. 115, (5), 756-764 (1985). Yarar-Fisher, C., Bickel, C., Kelly, N., Windham, S., Mclain, A., Bamman, M. Mechanosensitivity may be enhanced in skeletal muscles of spinal cord-injured versus ablebodied men. Muscle Nerve. 50, (4), 599-601 (2014). Gorgey, A., Mahoney, E., Kendall, T., Dudley, G. Effects of neuromuscular electrical stimulation parameters on specific tension. Eur J Appl Physiol. 97, (6), 737-744 (2006). Gorgey, A., Black, C., Elder, C., Dudley, G. Effects of electrical stimulation parameters on fatigue in skeletal muscle. J Orthop Sports Phys. 39, (9), 84-92 (2009). Gorgey, A., et al. Effects of Testosterone and Evoked Resistance Exercise after Spinal Cord Injury (TEREX-SCI): study protocol for a randomised controlled trial. BMJ Open. 7, (4), (2017). Nelson, M., et al. Metabolic syndrome in adolescents with spinal cord dysfunction. J Spinal Cord Med. 30, (s1), 127-139 (2007). Ashley, E., et al. Evidence of autonomic dysreflexia during functional electrical stimulation in individuals with spinal cord injuries. Paraplegia. 31, (9), 593-605 (1993). Hasnan, N., et al. Exercise responses during functional electrical stimulation cycling in individuals with spinal cord injury. Med Sci Sports Exer. 45, (6), 1131-1138 (2013). Fornusek, C., Davis, G., Russold, M. Pilot study of the effect of low-cadence functional electrical stimulation cycling after spinal cord injury on thigh girth and strength. Arch Phys Med Rehab. 94, (5), 990-993 (2013). Gorgey, A., Poarch, H., Dolbow, D., Castillo, T., Gater, D. The Impact of adjusting pulse durations of functional electrical stimulation cycling on energy expenditure and fatigue after spinal cord injury. J Rehabil Res Dev. 51, (9), 1455-1468 (2014). Ryan, A., Ivey, F., Prior, S., Li, G., Hafer-Macko, C. Skeletal muscle hypertrophy and muscle myostatin reduction after resistive training in stroke survivors. Stroke. 42, (2), 416-420 (2011). Sabatier, M., et al. Electrically stimulated resistance training in SCI individuals increases muscle fatigue resistance but not femoral artery size or blood flow. Spinal Cord. 44, (4), 227-233 (2006). Johnston, T., et al. Musculoskeletal Effects of 2 Functional Electrical Stimulation Cycling Paradigms Conducted at Different Cadences for People With Spinal Cord Injury: A Pilot Study. Arch Phys Med Rehab. 97, (9), 1413-1422 (2016). Gorgey, A., Martin, H., Metz, A., Khalil, R., Dolbow, D., Gater, D. Longitudinal changes in body composition and metabolic profile between exercise clinical trials in men with chronic spinal cord injury. J Spinal Cord Med. 39, (6), 699-712 (2016).